In the past nine months, we assembled a diversity and inclusion task force to review, and better understand Scouting’s relationship toward our diverse, melting pot /pluralist society. Our mission was to develop a roadmap that would ultimately unlock the program of Scouting for all families that want to raise children of character. It’s part of our strategic plan which is still under review – but diversity road map was met with enthusiasm and broad support. I deeply enjoyed working with the folks on this task force. Over the nine months, the size and make up of the group accordioned with various projects. There were nine formal members, yet in its widest interputation there were about 20 diverse people who contributed to build the roadmap. While we were conducting our work to present our proposal, the national organization began researching and considering allowing girls to join the BSA at all levels. It seems to me during Scouting’s hey day the 1930s through the late 1960s Scouting enjoyed universal appeal. Yet today, only a percentage of American families consider Scouting as a valuable, fun, community character education program for their kids. 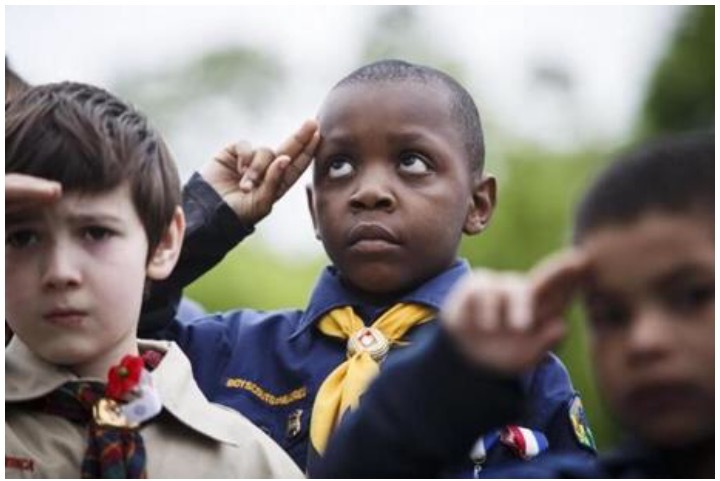 Ironically the American public widely views Scouting and it’s activities and outcomes in a positive light. When you talk to non-Scout families it sounds like this “I know Scouting does good things for the kids involved, it’s just not for us.” Or “Those activities seem exciting and valuable to my kids, but we do something else.” That sentiment is not just my opinion and observation, the BSA has done an enormous amount of market research and that is the common and consistent response. Sadly, even with so much market research over decades all pointing to the same truth, Scouting still didn’t know what to do. Although there have been sincere, genuine efforts over the past few decades, those efforts never seem to make long lasting sustainable impact. The key ingredient that was missing the willingness to widely and truly embrace. It’s my observation that in the 30s through the late 60s when Scouting enjoyed universal appeal. It did so because America valued a homogenous society. (Admittedly – I am not a sociologist!) Whether you were black, white, buddhist, gay, straight, male, female, Latino, immigrant or native society pushed you towards the American dream of apple pie and a white picket fence. Scouting tapped into and reflected that idea. Today, while the white picket fence is still a highly regarded ideal, we more willingly embrace each American’s right to determine “The pursuit of happiness” in their own terms. This is a culture change and this is hard work. A Scout is friendly. A Scout is a friend to all. He is a brother to other Scouts. He offers his friendship to people of all races and nations, and respects them even if their beliefs and customs are different from his own. Beyond that common ground (and safety!) all Scout communities self determine how they utilize the curriculum. To that end, each scout troop reflects its own community and culture. And the Scouting organization understands that, respects that, and defends that. While respecting and supporting each community’s unique culture and self determination we will simultaneously offer friendship to all.